Our "Wings of an Angel" Celtic Trinity Knot Charm Birthstone Bracelet is so stately looking. What an amazing design with a beautiful meaning. Look at the angel, angel wings and the Trinity in the center knot. All of this is masterfully weaved together in a traditional Celtic knot-work. 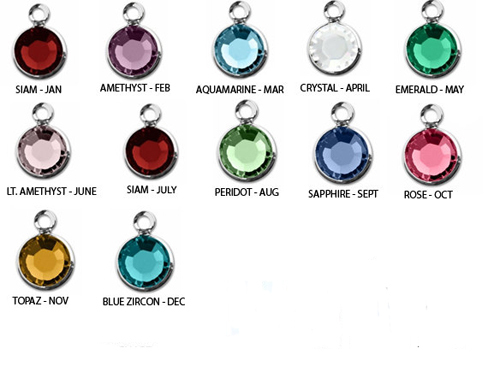 We can add as many birthstones as you would like now or they can be bought later. Put your stone,children's, grands. it could be a friendship or sister bracelet too. That is the great thing about custom. You PICK! The stones are a beautiful 6mm round swarovski crystals. You can adjust your charm bracelet to fit even small little girls by hooking it into any link. Add more charms to this keepsake. Pass it down to your generations. We are making this beautiful line in the USA . The adjustable link bracelet is made from 316L Stainless Steel. The charm is Sterling silver and rhodium ( tarnish protection) are over this stunning lead free pewter set. -Made with Care in the USA! -Sterling Silver and Rhodium over Lead Free Pewter. -Bracelet is made from 316L Stainless Steel. It is adustable up tp 8"
-genuine swarovski crystals 6mm round stones. -Bracelet is adjustable to fit even the smallest wrist.